What Adhesive Do You Use to Put Linoleum Down? For a tough, long-lasting and soft flooring underfoot, consider linoleum. Unlike wood flooring, linoleum is resistant to wear and tear, making it ideal for high-traffic areas of your home. Sheets of linoleum are available at home improvement stores along with all the materials you need to lay the flooring. To ensure that your linoleum lasts, choose the proper adhesive to hold it in place. 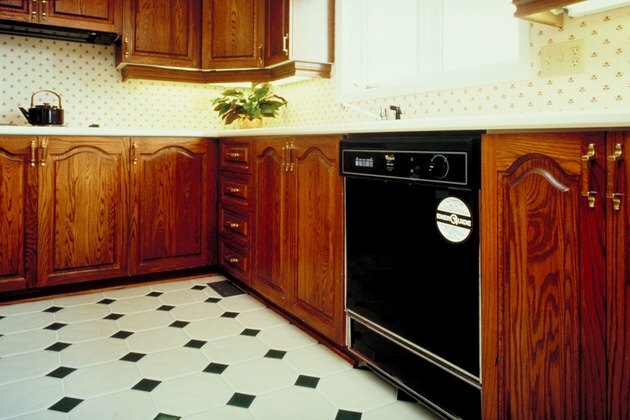 Linoleum is a good option for high-traffic kitchens. Linoleum flooring should not be confused with vinyl, but some use the term linoleum as the name for both true linoleum and sheet vinyl. Both are resilient, but linoleum is made from linseed oil, jute and other natural products, making it an environmentally friendly alternative to artificial vinyl. Some people choose linoleum because it is an eco-friendly product and they want to use adhesives to match. For such projects, look for low or zero VOC (volatile organic compounds) adhesives, indicating that these products emit the least amount of indoor pollutants. Plant-based adhesives are available for installing linoleum flooring. These include cellulose glue, rye flour paste, natural rubber glue and natural resin glue. Other types of adhesives are available for installing linoleum flooring. Some stores might produce a generically labeled glue called "linoleum adhesive." This is fine to use for installing the linoleum, and it makes selection easier. If you cannot find a product specifically designed for linoleum, look for other flooring adhesives used to install linoleum. These include wood glue, which is also called PVA glue; acrylate glue; and ethylene vinyl acetate glue, or EVA glue. One type of linoleum flooring does not require adhesive for installation. Tongue-and-groove boards laid on the floor lock together to create a solid floor above the subfloor. These are often referred to as floating floors because nothing connects them to the floor underneath. Boards at either end are nailed into the baseboard and the tight-fitting tongue-and-groove boards lock to support the floor. Such floors might resemble wood planks, but they do not require the constant care of wood. If you are removing old linoleum flooring from a home, find out when it was installed. Because linoleum is durable and long-lasting, you might still have the original linoleum flooring from decades ago. If the linoleum was installed between the 1920s and 1980s, it might have asbestos in the adhesive. Breaking up the asbestos into its natural fibers produces a health hazard. Call a professional to remove dated flooring that might have used asbestos.